VAN BUREN COUNTY, Mich. — Several Consumers Energy customers in a rural area of Van Buren County are outraged after getting bills that they say are more than 13 times the normal charge. “My bill went from $300 a month to $4,887 and I was like what the hell happened?” said Christina McCaid. McCaid is only one of the three customers in her neighborhood that got bills that skyrocketed for the month of August. Berry got an electric bill for nearly $500 this month, and her neighbor Jeff Boone, who lives alone, got one for more than $3,000, and her other neighbor, Christina McCaid, got hit with a nearly $5000 bill. “Usually in the summer time, maybe $300, but never a $500 bill,” said Berry. 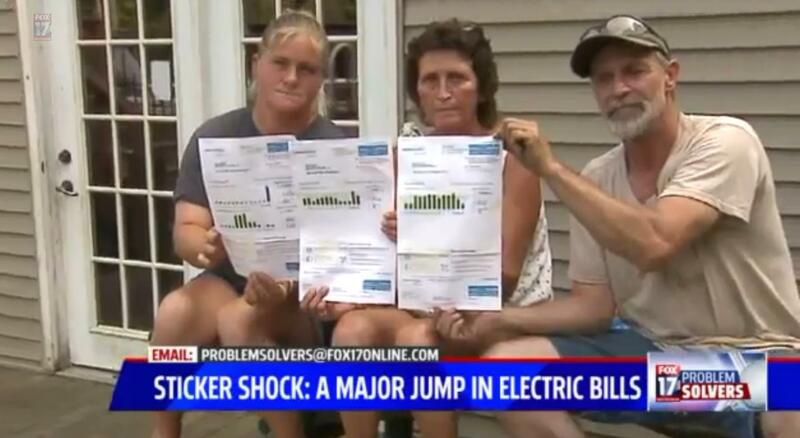 The neighbors say they can’t afford the high bills, and they wanted answers, so they called the Fox 17 Problem Solvers. Berry has lived in her home for 28 years, McCaid for five years, and Boone for 12 years, and they all say their bills are way too high. Consumers Energy believes the bills are not a mistake but a game of catch-up. In other words, if Consumers Energy underestimates a customer’s usage use in the past and didn’t make it to their house to get the actual reading, they estimate usage. Then at a later date when they get the actual usage, they tack the charges onto the bill. McCaid, Berry, and Boone aren’t satisfied with that answer. “It would be easier to come up with an extra $10 to $30 at the time, rather than $2,000 at the end of the year all at once,” said Boone. Last August, McCaid’s bill was almost $300, but this year it’s nearly $5000. Consumers told her on the phone that it was because she hadn’t had an actual reading in omewhere between 14 and 24 months,mnMcCaid said. “I mean, all of them estimated? All of them? All three of us? I just don’t believe it. I don’t,” said Berry. McKee said the utility is working hard to resolve these kinds of issues for good. They’ve already replaced 610,000 old meters with smart meters. “In the area of Van Buren County, we have upgraded our meters to communicating meters, so we are already getting those daily reads from meters. This will help us get away from estimated meter reads,” said McKee. “What really irritates me is that Consumers Energy can’t come out and read my damn meter, but you can get out of the car and change the damn meter. You know what I’m saying? It really burns me to no end,” said Berry to McKee. McKee said Consumers Energy is looking into why the bills are so high. Meanwhile, they’re offering a payment plan to the neighbors and. Consumers hopes to have all its in Michigan meters changed to smart meters by 2017. The smart meter actually sends usage like a text message to the utility daily, so they constantly know how much energy their customers are using. A few dozen people stood outside DTE Energy headquarters Sunday afternoon protesting the mandatory implementation of smart meter devices they feel are invasive and dangerous. Detroit — Orchestrated by the patriotic organization Warriors for American Revolution, the goal of the protest was to raise awareness about devices the group feels pose significant risks to personal health, public safety, and civil liberties. Michigan Civil Rights Department Will Hear Smart Meter Complaints! The board of trustees has adopted a resolution to allow the Michigan Public Service Commission to perform a careful analysis of the potential health and safety effects from the installation of smart meters in the township. The township has also asked that the MPSC demand the delay of the smart meters installation in Shelby Township if they are deemed a hazard to people’s short- and long-term health. Furthermore, the resolution says that if anyone can show medical documentation that his or her health is at risk by having a smart meter, that person can opt out. The board has also asked that the MPSC look into the smart meters’ potential to violate resident’s privacy. “It’s great that you guys are doing this. I applaud you but I don’t know if it’s going far enough,” said Pauline Holton. The Sterling Heights City Council voted 6-1 Nov. 15 to postpone adopting a resolution urging the Michigan Public Service Commission to undertake a thorough analysis regarding the installation and operation of “smart meters” by DTE Energy until a special meeting can be held to discuss the issue. According to Assistant City Manager/City Clerk Walt Blessed, the resolution was introduced after residents and others raised concerns about smart meters during recent meetings. Unlike traditional electric meters that merely record power use — and then must be read in person once a month by a meter reader — Smart Meters measure consumption in real time. By being networked to computers in electric utilities, the new meters can signal people or their appliances to take certain actions, such as reducing power usage when electricity prices spike. But the very interactivity that makes smart meters so attractive also makes them vulnerable to hackers, because each meter essentially is a computer connected to a vast network that some argue will be used to monitor residents’ activities. * The MPSC is hereby requested to perform a careful analysis of the potential health and safety effects which may result from the universal installation of smart meters for electric and gas utilities. * The MPSC is further requested to consider delaying the deployment of smart meters pending a determination, following careful study and review, that such meters are safe and will not have short-term or long-term negative consequences to the health of the citizens of Sterling Heights and the state of Michigan generally. * In the course of its deliberations, the MPSC should provide a forum that allows all interested parties to have their concerns over smart meters heard, including potential privacy and consumer rights issues. * The MPSC should also consider the merits of allowing consumers with medical conditions that may be affected by the operation of smart meters to opt-out. However, several people who attended the Nov. 15 meeting said that while the resolution is a good first step, it doesn’t go far enough. KALAMAZOO, Mich. (NEWSCHANNEL 3) – Consumers Energy is installing its smart meters across West Michigan, and they will be in Kalamazoo this summer. But some customers say they don’t want one, because they worry the meters will make them sick. The I-Team investigated whether or not there was any link between smart meters and your health. Old power meters were what’s called analog, with wheels turning to show how much electricity you used; these new ones are all digital and wireless and that’s what worries some customers. As Consumers Energy smart meters are coming to Kalamazoo’s neighborhoods, some customers say they’ve heard enough bad things about them they don’t want one. “I want to know more and I want to know for certain it is safe, truly safe,” said a customer who didn’t wish to be identified. The customer says what she’s most worried about, is whether it will make her sick. “There’s enough negative information to make us ask why,” she said. Across the country, there is ongoing debate about whether the meters come with health risks. Anura Lawson, in Califorinia, says they are causing her health problems. “I began to feel dizzy at first, migraines, heart palpitations,” she said. She says it started right after her meter was installed in 2012. And it affected her daughter Amira too. “My brain was running slower, I was like, I don’t know what’s going on,” Amira said. In December legislative hearings in Lansing–now on YouTube–highlighted possible health concerns around smart meters. Dozens testified about the issues they were having, like a couple from Muskegon who are consumers energy customers. “He has had an average of one seizure per month, and each time he has a seizure it affects not only his body but his mind,” one person testified to the committee. Oncologist Dr. Robert Nagourney, from the University of California-Irvine, says some people do have a condition called electromagnetic hypersensitivity. “We’re bathed in this type of radiation. Does it cause illnesses? Great question, difficult to answer,” he said. Experts say most people don’t have any problems, but some are more sensitive to radiation emitted from wi-fi, cell phones, and some smart meters. Consumers Energy, which has put in 450,000 smart meters already in West Michigan, says it has made its meters as safe as possible. “Folks who are concerned about radio waves coming out of the meters, I think they’re more informed when they’ve looked at our webpage and they know we’re using cell technology, we’re not even using radio frequency technology,” said Dennis McKee, with Consumers Energy. Consumers says its meters use cell phone towers and send just one text a day. But some industry watchdog groups in the state claim they are hearing health complaints from consumers customers. “Across the nation, there are many myths and misunderstandings that have been posted on the Internet about various meter technologies. All of them are safe, ours is certainly safe,” McKee said. Consumers does allow a customer to opt-out for $70 up front and about $10 a month. Consumers did reach out to the customer in our story and provided her more information about the meters.